This guide is a practical tool created to help you. Here you’ll find information, resources, and checklists to help you get organized and find the support that you might need. loved one’s caregiving team. Clarifying this ahead of time will make it much easier to navigate a crisis if one does occur. Make a plan. Putting together a caregiving plan now will help you respond more quickly and effectively should the need arise. It can also provide some peace of mind. A plan helps everyone get on the same page and keeps the focus on what’s best for your loved one and for you. If you are not your loved one’s legal spouse or next of kin you will likely need to put legal documents in place in order to carry out parts of this plan. It is important to take care of these before an emergency arises so that your loved one is able to state and verify their own wishes. Form a team. You will be more effective as a caregiver if you don’t try to do it alone. Find others who can help you, whether they’re friends, family members, community groups, or professional service providers. While other family members are likely sources of support, don’t overlook friends, colleagues, clubs or religious and other organizational affiliations as resources too. Stay focused on your loved one; it will be more effective if the team recruited is closely connected to the person in need of caregiving. Find support. Many issues may arise during your caregiving experience that require additional information and resources. Don’t hesitate to reach out to organizations and professionals with experience in helping family caregivers. Care for yourself. As a caregiver, it’s easy to forget about your own needs. But keeping up your energy and maintaining your health are critical in order to care for others. It’s just as important to plan for self-care as it is to create a plan for others’ care. Educate yourself about what the aging process looks like—not just day-to-day needs, but also health management and advocacy that may be necessary while navigating the healthcare system. Be honest with yourself about what you’re agreeing to, and understand your own capacity for helping before stepping into a caregiving role. Note: Words in italics are described in greater detail in the Glossary, and organizations identified with an asterisk (*) are listed in the Resources section. •	“I just read an article about gathering all your important papers. Is there someone who knows where those are and could get to them in an emergency? Would you like me to be that person?” Try not to anticipate how she or he may react. Just get the conversation started. It will likely take place over time. Be open, express your support and concern and, most importantly, listen. Another more personal opening might be discussing a friend who has declined, gone into care, or has passed away recently. Respect your loved one’s wishes. Every caregiving plan must center on the wishes of the person receiving the care. A plan should never be made without the participation, knowledge, and consent of your loved one. A person with a cognitive impairment should still participate as much as possible. Counter resistance. Your loved one might say, “I just don’t want to talk about it” or look for ways to put off the conversation. Be sensitive, but don’t give up. It’s hard for them to discuss what they may see as being a burden to you. If your first conversation doesn’t go well, try again. Start small, discussing just one aspect of your concerns. Every caregiving plan must center on the wishes of the person receiving the care. A plan should never be made without the participation, knowledge, and consent of your loved one. Size up the situation. Figuring out what your loved one’s priorities are – where they want to live and the nature of the care needed – will help you determine the next steps. It can lead you to find resources ahead of time. They may be hesitant to share the details of their finances or health, but approach them with respect and explain your intentions. Consider a tiered designation— instead of an assumption of current decline, determine if this is early planning, a response to acute illness or hospitalization, or something else. We’ve inserted a checklist of goals and needs to help you identify concerns related to your loved one’s home, health, finances, and legal needs. Review finances. Older LGBT adults are at greater financial risk than their non-LGBT peers because of disparities in earnings, employment, and opportunities to build savings over a lifetime. They also lack access to legal and social programs that are traditionally established to support aging adults.6 Money can be a particularly sensitive subject, but it’s often at the heart of many decisions you’ll make with your loved one about housing, health care, and other expenses. Caregivers are often surprised to learn that most health insurance, including Medicare, pays for little­—if any—of the costs of care in a nursing home or assisted-living facility. It also does not cover most help with daily activities such as bathing, dressing, or meals. Ask your loved one to review their bank accounts, investments, insurance coverage, and other loans. Find out whether they have long-term care insurance and funds or assets that can be used to cover potential care needs. Look into Medicaid early on to find out if your loved one qualifies for supplemental services. Also, note that veterans may have additional access to healthcare and caregiving assistance. MAKE A PLAN The most effective caregiving plans are made with the care recipient at the center of the discussion. Armed with the information you gathered from going through our goals and needs checklist, you can begin to explore the options available in the community and bring in other team members to help manage the workload. The plan doesn’t have to be extensive or fancy. You can never foresee every detail or scenario. The plan should include immediate needs as well as broader plans for the future. Use the goals and needs checklist as your guide. Options for addressing needs will depend on finances, the willingness of any support team, and the availability of community resources and services. A written summary of the plan can reinforce your loved one’s wishes and needs. However, be open to modifications as their situation changes. Your loved one’s needs may unfold differently than you had initially anticipated. Respect Privacy. If your loved one is open about their sexual orientation or gender identity to some people but not everyone, it may be helpful to have a private conversation about who can or should have access to that information and who should not. Take notes to help you keep track of this; you can refer to them later if you need to interact with those people on your loved one’s behalf. Remember, due to a lifetime of discrimination, some LGBT people feel that they need to return to the closet as they age. Always be sensitive to their concerns. Be Aware of Legal Obstacles. Many LGBT caregivers emphasized the importance of knowing your loved one’s rights and ensuring that all the required paperwork/legal documents are complete. Keep in mind that if you are not your loved one’s legal spouse or next of kin you will likely need specific legal documents in place to carry out parts of this plan. Advance directives, such as a health care proxy or living will, ensure that your loved one’s wishes will be followed should they become unable to communicate or make medical decisions. Also become knowledgeable about a release of information (ROI) and a do not resuscitate (DNR) directive. Each of these documents vary somewhat from state to state, but most are fairly easy to complete and do not require legal assistance. Visit www.aarp.org/advancedirectives to find free, downloadable, state-specific advance directive forms and instructions. Another document, generally called a power of attorney, authorizes someone to conduct banking and other business on behalf of a loved one. You may need the help of a lawyer to draft this document, though that is not always required. If you do not have a lawyer, or don’t think you can afford one, contact your local Area Agency on Aging for resources. It is important to get this paperwork done before something unexpected happens: not having the proper documents in place can mean that decision-making reverts to a family member with whom your loved one may not have a close relationship, or to professionals who never knew your loved one at all. Avoid Discrimination and Anti-LGBT Attitudes. Given that anti-LGBT attitudes, or outright discrimination in services, accommodations, and professional treatment still exist, especially in certain areas of the country, it is important to respect your loved one’s personal history and desires. In particular, your loved one may desire to fight the resolution of an injustice. Supporting your loved one, as best you are able, is the appropriate course to take. Remember that you are there for them. Legal organizations, listed in Resources, are available to contact for information and support. Anti-LGBT attitudes may also exist within a loved one’s biological family. A carefully drafted set of legal documents can be crucial and a gay-affirmative lawyer can be an invaluable resource. Outside consulting by gay-affirmative professionals in general can be helpful for resolving family disagreements in favor of a loved one’s preferences. searching locations and facilities by a person who can visit possible places. Someone else could spend some weekends helping your loved one sort through their belongings. You may feel hesitant to ask others for help, but some people may need only a little encouragement to take on a task – and they may feel left out otherwise. In addition, many people get great satisfaction from helping. Don’t feel guilty about asking. Be sure to ask your caregiving team members about their preferences for who does what task and to take your loved one’s wishes into account; for instance, they might be more comfortable with one particular person rather than another handling financial affairs. Build and support your team. Putting a support team together that is deep and wide can strengthen both you and your loved one’s ability to deal with any issues that emerge. It will also help assure that as team members’ ability to help out changes; you will still have support from the larger group. Identify the people who will be the core members of the team, get your loved one’s permission to involve them, and then bring them together for a nuts-and-bolts conversation. If you have been able to pull together a team of people to help it’s now time to figure out who is going to do what. This might take place in a face-to-face meeting, over a conference call, or through a series of emails. Agree together and be clear about specific tasks that each team member will take on. Before meeting, you and the other team members should consider… •	What are your top three concerns for your loved one? •	What are any immediate and long-term needs you may have identified? •	What are your own feelings and outlook on the situation? •	Who is the best person to start or lead the group conversation? •	What are your goals or what is the best outcome you think might result from the conversation? •	What are you prepared to do and what are you unable to do? •	What is most difficult for you about having this conversation regarding your loved one’s care? It’s important to have a clear leader to keep the process moving and make sure people understand what’s been decided. In most cases, one person assumes the primary role because he or she lives nearby, has a close relationship, or simply is a take-charge person. Expect that there may be conflicts and don’t be afraid to talk through them. It’s better to do so now and not in a time of crisis. Get help wherever you can and try to stay mindful of your own feelings and needs to avoid burnout. Afterward, an ongoing platform for connection and check-in will be important. A point person will still be necessary to keep this process organized and in check. A conference call or team meeting on a quarterly (or monthly) basis can help ensure that everything is on track and people feel supported as they support your loved one. Platforms for ongoing communication such as www.caretree.me/families can be helpful. Caregiving on your own. Although a caregiving team is ideal, you may find yourself in a situation where there are very few people other than you who can participate in your loved one’s care, or whose help your loved one will accept. If this is the case, it may be helpful to reach out to local agencies that provide supportive services—you’ll find more information and suggestions in the “Find Support” section. Social workers, doctors, etc. can be important members of a care team, and the questions listed above can be useful to ask them as well. You may also be able involve some of your own friends or family members, who can support YOU by taking simple caregiving tasks like grocery shopping or errands off your plate. Get help wherever you can and try to stay mindful of your own feelings and needs to avoid burnout. FIND SUPPORT The LGBT community has a deeply-rooted history of caring for its own, without accepting help from “outsiders,” and you or your loved one may be accustomed to that culture. A distrust of social service providers may be based on very real experiences of discrimination or harassment earlier in life. However, it’s important to recognize your limitations and recognize that it’s okay to reach out for extra support. If you’ve discovered that the scope of care is beyond what you or your team can provide, or if you’re not sure what is needed, you might consider getting help from an organization in your community Locate community resources. A variety of support services are available to people ages 50 and over and their caregivers throughout the United States. Your local Area Agency on Aging can typically help connect you to services such as homedelivered meals, transportation, adult day care centers, care management, and more. Check into the services offered in your community through the Eldercare Locator* at www.eldercare.gov. In addition, SAGENet,* SAGE’s network of local affiliates, has 30 locations in 20 states across the country. www.sageusa.org/advocacy/sagenet.cfm. Consult a professional. Often times a loved oneâ&#x20AC;&#x2122;s needs can be complex especially when health, emotional and financial issues come into play. A geriatric care manager, who is often a nurse or social worker, can help you sort things out and determine what is needed, find services, and arrange and monitor professional care. Perhaps your workplace has an Employee Assistance Program that can help connect you to professionals and services in your community. You can also find professionals through the Eldercare Locator* at www.eldercare.gov. Hire help. If you see that your loved one needs extra help with daily activities, you can explore the range of home care services available. Some home care workers assist with housekeeping, meal preparation, laundry, and shopping. Others provide more hands-on help with bathing, dressing, and transferring from one position to another, which usually requires special training, a license, or certification, depending on the laws in your state. Your local Area Agency on Aging can help you identify the appropriate services and connect you with local providers. They can also help you determine eligibility for publicly funded services. If you work with a home care agency or hire someone on your own, be sure to ask about licensing, background checks, training, and costs. 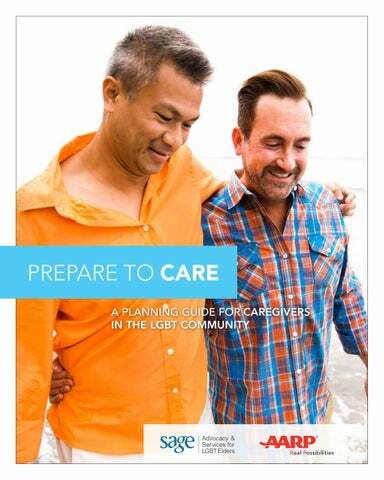 As important, inquire whether the hired caregiver is familiar and comfortable with LGBT culture. Get references to ensure good quality care. Visit the AARP Caregiving Resource Center* at www.aarp.org/caregiving for more information on how to find and hire help. If you see that your loved one needs extra help with daily activities, you can explore the range of home care services available. of housing alternatives available. Not all types of housing are available in every community. Once you know the type of living arrangement desired, visit several facilities, and be sure to talk with residents and their families. For more information about how to choose the right housing option, go to the AARP Caregiving Resource Center* at www.aarp.org/caregiving. If selecting a nursing home, go to Medicare’s Nursing Home Compare* page at www.medicare.gov. Also, you can refer to the Long-Term Care Ombudsman* (LTC) program, which lists complaints resolved and/or not resolved, when looking for long-term care environments. www.ltcombudsman.org. Find Welcoming Services. You or your loved one may be concerned about whether some of these agencies and services will be welcoming to LGBT people. You can start by searching for providers with a SAGECare* LGBT aging cultural competency credential at www.sageusa.org/care. If those don’t meet your needs, ask for referrals from friends in the community or from a local LGBT Community Center or other LGBT organization. Look at an agency’s advertising, brochures, and website for clues that they knowingly and intentionally serve LGBT people. You can also ask an agency directly if its staff has received cultural competency training, if their nondiscrimination policy includes sexual orientation and/or gender identity, and if they have experience serving LGBT clients. Ultimately, trust your instincts in choosing a provider that’s a good fit for your loved one and for you. For additional resources about finding LGBT-friendly services, visit the National Resource Center on LGBT Aging* at www.lgbtagingcenter.org. you’re the only person your loved one has to lean on for support which can be stressful and isolating. If you cared for friends and loved ones during the AIDS epidemic, you may find that caregiving now triggers difficult memories or emotions. Whatever you’re feeling, it’s helpful to recognize your emotions and to know that you are not alone in feeling this way. Finding someone to talk to about these feelings can be very helpful. Take care of yourself. Allow yourself to take a break. Tend to your own needs for exercise, sleep, and healthy eating. Find ways to reduce your stress and make sure to take time to have fun! If you invest in caring for yourself, you often return to your responsibilities renewed and better able to provide care for your loved one. Consider tapping into a caregiving social network such as www.caringbridge.org for support. Caregiving services and support groups. There’s comfort in knowing others are experiencing the same ups and downs as you. Others may also give you ideas about strategies and resources available to lighten your load. There are community services to help you in your journey of caregiving. Don’t feel guilty about needing time off or help with understanding complex information, and remember that your loved one may also benefit from having a wider circle of care. Consider finding services and support groups available in your community through Eldercare Locator. * If you are interested in LGBT-specific services or support, SAGE can help you locate resources in your area or online. Visit www.sageusa.org or call the SAGE LGBT Elder Hotline at 1-888-234-SAGE. Online support groups can be a good way to find a community of caregivers who may be having similar experiences. Some good places to start: www.aarp.org/caregivingcommunity https://www.caregiver.org lgbt-caring-community-online-support-group http://openhouse-sf.org/resources/lgbt-caregiving Cancer specific: http://lgbtcancer.org http://www.cancercare.org/support_groups/ 116-lgbt_caregiver_support_group As you seek out caregiving resources, you are likely to see the term “family caregiver” used frequently. In general, this term serves to distinguish unpaid loved ones like you from paid professional caregivers such as home health aides. In most cases, “family caregiver” is meant to include close friends and families of choice, and caregiver services and resources are available to all unpaid caregivers, not just family members. You should feel free to take advantage of those resources and to identify yourself as a caregiver regardless of your relationship to the care recipient. Share your caregiving story with others at www.iheartcaregivers.org. GLOSSARY Activities of Daily Living (ADLs) Basic tasks of everyday life that include, but are not limited to, dressing, bathing, eating, and toileting. Adult Day Services Structured, comprehensive programs, including a variety of health, social and related support services during any part of the day but for less than 24 hours, provided at local centers for adults who need some supervision and/or support. Adult Protective Services A public agency that investigates reports of abuse and neglect of vulnerable adults and that usually works with law enforcement. Situations of immediate danger should be directed to 911 or the local police. Advance Directives A document (or set of documents) that enables someone to make their wishes clear regarding medical treatment in advance of needing said treatment. See Health Care Power of Attorney (Health Care Proxy) and Living Will. Area Agency on Aging (AAA) or Aging and Disability Resource Center (ADRC) An agency designated by the state with the responsibility for planning and coordinating services for older people and sometimes for adults with disabilities within a specific geographical area. Both agencies provide information, resources, assistance, and links to community services. Assisted Living Residences Housing for those who may need help living independently, but who do not need skilled nursing care. The level of assistance varies among residences and may include help with bathing, dressing, meals, and housekeeping. Certified Nurse Assistant (CNA) A professional who helps patients or clients with healthcare needs under the supervision of a Registered Nurse. Community Meal Program Balanced nutritious meals served at community locations for those ages 60 and over as well as their younger spouses. Conservator A person appointed by a court to handle the affairs of someone who cannot do so independently. A conservator usually handles only financial affairs. Continuing Care Retirement Communities Housing that offers a variety of living options and services including independent living, assisted living, and skilled care, often all on the same campus and designed to meet a personâ&#x20AC;&#x2122;s changing needs. Discharge Planner A professional who assists individuals and their families or caregivers in developing a plan of care for an individual following a hospital or nursing home stay. DNR: Do Not Resuscitate Order An order written by a doctor to fulfill an individual’s expressed medical care wishes during a medical emergency. Durable Power of Attorney for Finances A legal document that allows one to designate another trusted person to make financial decisions on one’s behalf. The designation “durable” means that it will stay in effect if you become unable to manage your own financial affairs. Family and Medical Leave Act (FMLA) A law that requires some employers to let an employee take unpaid time off work (up to 12 weeks) for illness, having/adopting a baby, or caring for an ill family member. Your job or its equivalent is guaranteed when you return. If you work for a small employer or are a new employee, or if you’re caring for someone who’s not a spouse or legal relative, you may not qualify for FMLA. Check with your employer for details about your eligibility. Family Caregiver Anyone (not just a family member) who provides unpaid assistance to another person who is ill, or disabled, or needs help with daily activities. Family of Choice Diverse family structures that include but are not limited to life partners, close friends, and other loved ones who are not biologically related or legally recognized but who provide social and caregiving support to an individual. Geriatric Care Manager A professional who assesses an individual’s mental, physical, environmental, and financial conditions and creates a care plan to arrange housing, medical, social, and other necessary services. Guardian A person appointed by the court who is responsible for the care and management of an individual determined to no longer have decision-making capacity. Health Care Power of Attorney (Health Care Proxy) A special kind of durable power of attorney in which one appoints another person to make health care decisions in the event that one should become unable to do so. Health Insurance Portability and Accountability Act (HIPAA) A federal law that protects private health information, setting rules and limits on who can access this information and permitting its release as needed for patient care. Home Health Agency An agency often certified by Medicare to provide health-related services in the home such as nursing, occupational, speech, or physical therapy, social work, and/or personal care. Home Health Aide An individual who helps someone with bathing, dressing, grooming, assistance with meals, and light housekeeping. Homemaker Services A service that provides assistance with general household activities such as meal preparation, cleaning, laundry, and shopping. Hospice Care Professionally coordinated support services, including pain and symptom management, social services, and emotional and spiritual support for terminally ill people and their families. The care can be provided at home as well as in other settings such as hospitals and residences. Instrumental Activities of Daily Living (IADL) Basic tasks of everyday life that include, but are not limited to: managing money, shopping, telephone use, travel in the community, housekeeping, preparing meals, and taking medications correctly. In-Home Care In-home care is a service that provides caregivers who will come into the home to assist with activities of daily living, including light housekeeping, grocery shopping, meal preparation, and grooming. Some provide additional services related to help with personal care for toileting and bathing. Living Will (Part of a Health Care Directive) A legal document that specifies a personâ&#x20AC;&#x2122;s wishes about lifesaving medical treatments should he or she have a terminal condition and become unable to communicate those wishes. Long-Term Care Insurance Insurance that can pay part of the cost of care received in the home, assisted living residences, nursing home, and other designated services depending on the policy purchased. Long-Term Care Ombudsman A person who investigates and resolves complaints on behalf of residents of nursing homes and other long-term care facilities. Medicare A federal health insurance program for people age 65 and over, and for some younger persons with disabilities. Medicare covers hospital stays, doctor visits, prescription drugs and other health care related needs. Medicare does not cover long-term care. Medicare Savings Program An assistance program for people with Medicare who need help with paying their Medicare expenses, such as premiums, co-pays, and deductibles for Medicare Parts A & B.
Medicaid The federal/state funded health and long-term care program for people with limited income and assets. Medicaid is administered by the states within federal guidelines so eligibility and coverage may differ from state to state. For long-term care services, states have additional eligibility rules. Nursing Homes Facilities that provide immediate care – assistance with personal care and activities of daily living – and/or skilled 24-hour medical, nursing, and rehabilitation care, often during a transition from hospital to home. The latter may also be called a skilled nursing facility. Palliative Care Professionally coordinated services that focus on the physical, mental, social, and spiritual needs of those with life-threatening illness and their loved ones. Palliative care seeks to maintain the patient’s highest level of comfort, pain management, and quality of life. Note that palliative care is not the same as hospice. Personal Emergency Response System (PERS) A portable electronic device with a call button that a person can use to summon help in an emergency. Release of Information (ROI) A legal authorization to release health records to a designated individual.. Respite Care A temporary break from providing care for a loved one. Respite care can be provided by friends or family or through services such as attending an adult day services center. You can also have a paid home-care worker come to the home, or find an accommodation in a nursing facility for a short stay. Social Security A benefit earned by eligible workers that provides guaranteed inflation-adjusted monthly income for life. A person with the required number of quarters of – who has thereby paid into Social Security to later earn benefits – is eligible at age 62 or if disabled. Certain family members may be eligible for benefits as well. Supplemental Security Income (SSI) A monthly cash benefit for people who are 65 years of age and older, disabled, or blind, and who have limited income and assets. RESOURCES Inclusion in this list does not necessarily indicate that an organization or agency is LGBT-affirming. We encourage you to ask questions when seeking services in order to determine whether they will be welcoming. See the above discussion on Finding Welcoming Services, and visit http://www.lgbtagingcenter.org/resources/resource.cfm?r=4 for tips and suggested questions. Not all resources will be available in your area. Visit resource websites or call to find out more. AARP Caregiving Resource Center: www.aarp.org/caregiving or 1-877-333-5885 Your one-stop shop for tips, tools, and resources while caring for a loved one. For Spanish resources visit www.aarp.org/cuidar or call 1-888-971-2013. AARP Advance Directive Forms: www.aarp.org/advancedirectives Free, downloadable state-specific advance directive forms and instructions. AARP Medicare Q&A Tool: www.aarp.org/MedicareQA An easy-to-use online tool that provides answers to frequently asked questions about Medicare. AARP Health Law Answers: www.healthlawanswers.org An online tool designed to help you understand what the health care law means for you and your family and where to go for information in your state. AARP Long-Term Care Cost Calculator: www.aarp.org/costcalc Find and compare the costs of home care, assisted living, and other services throughout the United States. Administration on Community Living: www.acl.gov The federal agency responsible for advancing the concerns and interests of older people. The website has a variety of tools and information for older adults and family caregivers. Aging Life Care Association: www.aginglifecare.org This association can help you find a private geriatric care manager in your community. Alzheimer’s Association: www.alz.org or 1-800-272-3900 Resources, tools, and a 24-hour helpline for people with Alzheimer’s disease and their families. American Cancer Society: www.cancer.org or 1-800-227-2345 From basic information about cancer and its causes to in-depth information on specific cancer types – including risk factors, early detection, diagnosis, and treatment options. American Diabetes Association: .www.diabetes.org or 1-800-342-2383 Resources and research to prevent, cure, and manage diabetes. American Heart Association: .www.heart.org or 1-800-242-8721 Resources that will help you better care for someone who has heart disease or who has had a heart attack, heart surgery or a stroke. American Civil Liberties Union (ACLU): www.aclu.org or 212-549-2500 Evaluates and supports civil liberties cases and issues to defend people from government abuse and overreach. Argentum: www.argentum.org Formerly the Assisted Living Federation of America. Information and resources on assisted living options and how to find them..
Care.com: www.care.com A resource to find caregivers you can hire directly. Caregiver Action Network: www.caregiveraction.org or 202-454-3970 Information, educational materials, and support for family caregivers. Center to Advance Palliative Care: www.getpalliativecare.org Provides comprehensive information about palliative care and has a searchable provider directory of hospitals. CenterLink: www.lgbtcenters.org Locate your nearest LGBT Community Center. Department of Veterans Affairs: www.va.gov or 1-800-827-1000 Information about eligibility and benefits for veterans and their families. Eldercare Locator: www.eldercare.gov or 1-800-677-1116 A public service of the U.S. Administration on Aging that connects caregivers to local services and resources for older adults. Elizabeth Dole Foundation: www.elizabethdolefoundation.org Created to help American military caregivers by strengthening the services afforded to them through innovation, evidence-based research, and collaboration. Family Caregiver Alliance: www.caregiver.org or 1-800-445-8106 Tools and resources for family caregivers, including the Family Care Navigator, a state-by-state list of services and assistance. GLBTQ Legal Advocates & Defenders (GLAD): www.glad.org or 1-800-455-GLAD Advocates for LGBT people by working to end discrimination through litigation. Lambda Legal: www.lambdalegal.org/issues/seniors or 1-866-542-8336 Aims to achieve full civil rights for LGBT people through education, policy, and litigation. LeadingAge: www.leadingage.org Consumer information on long-term care facilities and services, and how to access them. Long-Term Care (LTC) Ombudsman: www.ltcombudsman.org Long-term care ombudsmen are advocates for residents of nursing homes, board and care homes and assisted living facilities. Ombudsmen provide information about how to find a facility and what to do to get quality care. Lotsa Helping Hands: www.lotsahelpinghands.com A website that helps organize and coordinate caregiver help, including a calendar and reminders. Medicare: www.medicare.gov or 1-800-633-4227 Provides information about the Medicare program and how to find Medicare plans and providers. Caregivers can also find a tool on the website to compare home health care agencies and nursing homes. National Academy of Elder Law Attorneys: www.naela.org A professional association of attorneys who specialize in legal services for older adults and people with special needs. Find information on legal issues effecting older adults and a database of elder law attorneys by state. National Alliance for Caregiving: www.caregiving.org This organization is dedicated to improving the quality of life for caregivers and those they care for through research, innovation, and advocacy. National Asian Pacific Center on Aging: www.napca.org Educates, empowers, and advocates on behalf of Asian American and Pacific Islander aging community. Offers toll-free helplines in English, Chinese, Korean and Vietnamese. National Association for Hispanic Health: www.hispanichealth.org or 1-866-783-2645 The Hispanic Family Health Helpline and its Su Familia provide free and confidential health information for Hispanic families. National Association of Home Builders: www.nahb.org/caps or 1-800-368-5242 A web-based directory of Certified Aging-in-Place Specialists who can identify and/or provide home modifications that make a home accessible, safer, and more comfortable. National Association for Home Care & Hospice: www.nahc.org Consumer information on how to select a home care provider or hospice. National Association of Social Workers: www.socialworkers.org This organization maintains a directory of licensed social workers at www.helppro.com/nasw. National Caucus and Center on Black Aging: www.ncba-aged.org Helps to protect and improve the quality of life for minority and low-income seniors. National Center for Lesbian Rights: www.nclrights.org Legal Helpline: 1-800-528-6257 Focuses on LGBT equality through litigation, legislation, policy, and public education. National Clearinghouse for Long-Term Care Information: www.longtermcare.gov Information and tools to help plan for future long-term care needs. National Hispanic Council on Aging: www.nhcoa.org The leading national organization working to improve the lives of Hispanic older adults, their families, and their caregivers. National Hospice and Palliative Care Organization: www.nhpco.org or 1-800-646-6460 This organization provides free consumer information on hospice care and puts the public in direct contact with hospice programs. National Indian Council on Aging: www.nicoa.org Advocates for improved comprehensive health and social services and economic well-being for American Indian and Alaska Native Elders. National Resource Center on LGBT Aging: www.lgbtagingcenter.org An online clearinghouse of educational resources related to LGBT aging that includes resources for caregivers. National Respite Network: www.archrespite.org A service that helps people locate respite services. NIH Senior Health: www.nihseniorhealth.gov or 1-800-222-2225 Fact sheets from the U.S. National Institutes of Health can be viewed online or ordered for free. Rosalynn Carter Institute for Caregiving: www.rosalynncarter.org Created to support caregivers – both family and professional – through efforts of advocacy, education, research, and service. 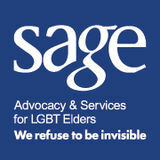 SAGE (Services and Advocacy for Gay, Lesbian, Bisexual & Transgender Elders): www.sageusa.org The oldest and largest LGBT aging organization in the U.S., providing direct services in New York City and across the country through a network of SAGE affiliates. For support and information, call the SAGE LGBT Elder Hotline at 1-888-234-SAGE or SAGE@LGBThotline.org. Operated by the GLBT National Health Center, this hotline offers peer-support to callers who are often very isolated, sometimes still closeted, and in need of a caring, non-judgmental person to talk with. Hotline operators don’t give advice – instead, they listen and they care!. SAGECAP: www.sageusa.org/sagecap A program that provides counseling, information, support groups and more to gay, lesbian, bisexual, and transgender caregivers. SAGECare: www.sageusa.care SAGECare provides training and consulting on LGBT aging issues to service providers. SAGECare offers the added benefit of providing qualifying agencies with a national credential to help consumers identify them as LGBT-friendly. Social Security Administration: www.ssa.gov or 1-800-772-1213 Information on retirement and disability benefits, including how to sign up for Social Security. State Health Insurance Assistance Program (SHIP): www.shiptacenter.org or 1-877-839-2675 Your local SHIP offers one-on-one counseling assistance for people with Medicare and their families. The Conversation Project: www.theconversationproject.org Created to help people talk about their wishes for end-of-life care. This Caring Home: www.thiscaringhome.org A resource that provides ideas for home modifications. Transgender Law Center: www.transgenderlawcenter.org or 877-847-1278 Focuses on changing law, policy, and attitudes so that all people can live safely, authentically, and free from discrimination, regardless of their gender identity or expression. Veterans Administration: www.caregiver.va.gov or 1-855-260-3274 Provides supports and services for families caring for veterans. Connects caregivers with local caregiver support programs for veterans. Village to Village Network: www.vtvnetwork.org An organization that helps communities start Villages, which are membership-based groups that respond to the needs of older people within a geographic area. Find Villages across the U.S. online. Needs First determine if there is an immediate need under each area. If there is not a pressing issue, prioritize the tasks to be addressed and develop a timeline. Need 1. Better understand and manage Mom’s medical care. 2. Move Mom to a new home. 3. For the caregiver: Relax with friends once a week. Call Mom for grocery list at lunch, shop after work and drop over.